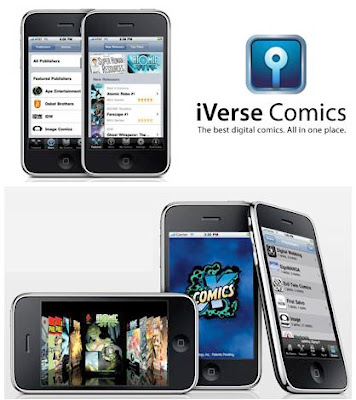 Nerd that I am, the first two apps I downloaded for my iPod Touch (which for now I'm calling Cerebro, but I'm not completely satisfied with that) were for comics readin', iVerse Comics and comiXology Comics to be exact. My only experiences with digital comics have been web strips, awkward PDFs, and site-specific readers that just don't work (trying to read the Clone Wars comics on StarWars.com was an infuriating experience), so I really wasn't sure what to expect. But hey, new technology beckoned, and iTunes changed their pricing standards so that these once paid apps were now freebies. And I loves me some free stuff. And while I was skeptical, I have to admit that reading comics on the Touch or iPhone is a decent experience. They're easy to read, easily reformatted to portrait or landscape layout, and most surprisingly, I have encountered very few awkward/hard-to-read pages due to panels being resized or cut down to fit the screen. I'm sure a lot of the latter has to do with the specific titles being made available for the devices, but still. And while both apps have advantages over one another - I like the page layout and transitioning of iVerse better, but comiXology appears to have a slightly better library of available titles so far - they both get the job done well, and are the best time-killers I have available to me right now. Waiting for take-out or at the doctor's office is a lot more tolerable now. But here's the thing: I haven't found a single comic book I'd actually pay to read this way. And that's a problem for the digital comics initiative as a whole, I'd say. Both apps have a slew of free titles available, and that number is constantly increasing. And obviously, this is a terrific way for people like me to sample books they might have otherwise missed for whatever reason. For instance, I've sampled both The Middleman and Tania Del Rio's manga-makeover version of Sabrina the Teenage Witch through comiXology, and I really enjoyed them both, enough that I want to read more of these books now. But I'm not buying them through comiXology, I'm getting the actual books. The trade of the first few issues of manga Sabrina is already on the way to me from Amazon, and the collected Middleman is definitely on my want list. It may be the old-fashioned bibliophile library boy in me, but when I want the book, I want the book, even if it costs me a little more and takes longer to find. Am I completely opposed to buying comics in a digital-only format? No. 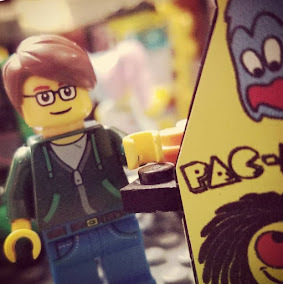 If it's exclusive content that I want badly enough, or something that's long out of print in physical form, then yeah, I'd probably be willing to pony up the money. But convenience isn't always going to be enough to make me pass up the format that I prefer for dozens of reasons. I think the apps are a great form of entertainment, and so far they're doing a great job of selling me comic books. But they're not yet convincing me that I should be buying my comics digitally, and I doubt I'm alone in this regard. That seems like a huge hurdle they're going to need to overcome before "the future of comics" becomes a workable now.